Skinfinity White C Essence is a natural Vitamin C formulation specially created to provide intensive antioxidant, moisturising and firming treatments. 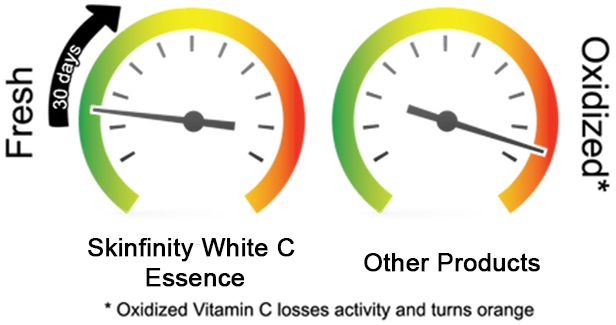 Adding the benefits of Nonapeptide, Niacinamide and Licorice to the proven properties of Vitamin C, Skinfinity White C Essence offers your skin the safest and most effective lightening available. This unique formula has the power to inhibit the production of melanin while repairing damaged skin caused by exposure to the sun. To ensure potency and freshness, the product comes as separate powder and liquid ingredients that only activate when mixed. This way you can ensure your skin enjoys the full benefit of the freshest, most effective topical Vitamin C available. Open Essence 1 and Essence 2. Squeeze Essence 1 into Essence 2. Mix well to completely dissolve the Vitamin C powder in Essence 2. Apply the White C Essence (mixture) twice daily (in the AM and PM). It is recommended to keep the remaining White C Essence (mixture) refrigerated. Best to use up within 2 weeks before it gradually degrades.